In order to utilize your new stethoscope to it’s maximum capacity, it’s important that you learn, know, and understand the basic components of a stethoscope. Here’s a quick description of the basc parts, and you can see the image to the right to read more and see a large diagram. 1 How to Use a Stethoscope? 3 Why Does a Doctor or Nurse use a Stethoscope? Diaphragm – The flat circular piece constructed from metal at the end of the stethoscope used to capture low pitched sounds. Bell – This is a smaller cup-shaped object on the back of the diaphragm used to capture high pitched sounds. Tubing – Sounds are transmitted from the diaphragm or bell through the acoustic tubing to the earpieces via the ear tubes. Aural Tubes – Between the earpieces and the acoustic tubing there are short tubes, usually constructed of metal they transmit low-frequency sound better. Earpieces – Soft rubber earpieces are used to help block out external sounds and carry the sound from the diaphragm effectively. Believe me, This is not a good way to use Stethoscope! If you are practicing you can use a stethoscope on yourself if you do not have someone with you willing to let you practice on them. You can listen to the heart with a stethoscope by placing the diaphragm as near as possible. The heart is located just behind and slightly left of the breastbone, between the 4th and 6th ribs. Place the diaphragm of the stethoscope on the skin and listen to the heartbeat, move it around a little and listen for the loudest place. A normal heartbeat sounds like ‘’lub-dub’’ as the heart contracts. While just about everyone is familiar with the sound of a heartbeat it’s not uncommon to hear some other sounds. Heart murmurs make a ‘swoosh’ noise as blood flows through a valve that may not be opening fully. Do not be alarmed if you hear any of these other noises on yourself or someone else, it’s likely not affecting them in any way. Try flipping the diaphragm over and use the bell to and compare how different the sounds are between the two methods. Normal sounding lungs should not have any wheezing or crackling. Stethoscopes are used to listen to a person’s lungs too. Place the stethoscope over your chest and listen as you breathe in and out slowly. Again, move the stethoscope around the chest area and compare sounds to find the strongest area. Here is An nice infographic to show you how you should use a stethoscope properly or you may skip the infographic and read the text. 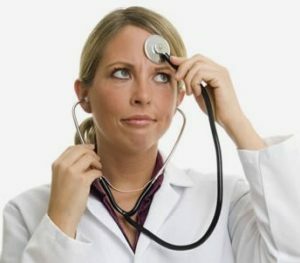 How to Use a Stethoscope? Using a stethoscope for the first time can be daunting. The following steps will help teach you how to use a stethoscope. You’ll be using your stethoscope like a professional in no time! Using a quality stethoscope is important, and it’ll be easier to learn how to use a stethoscope with quality equipment! Using a better quality stethoscope will make it easier for you to listen to the sounds from your patient’s body. Generally, single tubed stethoscopes are better than double ones. The tubes in double tubed stethoscopes can rub together creating noise that can make it hard to hear the sounds from your patient. The best kind of tubing is short, thick and relatively stiff. If you plan to wear the stethoscope around your neck, a longer tube may be better. Before you begin, make sure that the tubing is free of any leaks by tapping the diaphragm. When you tap the diaphragm you should be able to hear a corresponding sound from the earpiece. If you can’t hear anything, there may be a leak in the tubing. Before you begin using the stethoscope, it is important to adjust the earpieces so that they face forward and fit in your ears well. If you don’t adjust the earpieces, you may not be able to hear anything! When adjusting or changing the earpieces on your stethoscope, it’s a good idea to choose earpieces that fit snugly and create a solid seal with your ears. This will keep out ambient noise. Depending on what you are using your stethoscope for, there will be different chest pieces available. Generally, chest pieces will come in different sizes for children and adults. There may also be some small variation between brands. To listen to the heart or abdomen of your patient, you will want to move your patient into a ‘supine’ position lying down. To listen to the lungs, you may want your patient to sit up. Remember that the sounds from your patient’s body will vary depending on how you position them. Try and listen from a variety of angles and positions to ensure you fully capture any sounds. As you probably know, the head of a stethoscope has two sides, the diaphragm and bell. The diaphragm is generally superior for hearing medium or high-pitched sounds. The bell will be better for hearing low-pitched sounds. If you need super accurate or detailed sound measurements from your patient, you may want to use an electronic stethoscope. Electronic stethoscopes amplify the sounds from a patient’s body, making it even easier to hear the heart and lungs. Electronic stethoscopes can be expensive though. Once you’ve done it a few times, listening to a patient’s heart will become second nature! To start, position the diaphragm on the upper left part of their chest, approximately where the 4th to 6th ribs meet. Listen to the heart for a minute or so. When listening, ask your patient to relax and breathe normally so that you can hear the normal sounds of the human heart. A healthy heart will make a “lub-dub, lub-dub” sound. When listening, count the number of heart beats during the minute. For a normal adult and child over ten the heart will beat around 60-100 times per minute. A well trained athlete may have a heartbeat of around 40-60 beats per minute. When you’re listening to your patient’s heart, you’ll want to pay attention for any abnormal sounds. Anything that does not sound like the normal “lub-dub, lub-dub” sound can be considered abnormal. If you hear a “whooshing sound” your patient may have what is called a heart murmur. At its most simple, a heart murmur is blood rushing quickly through the various valves in the heart. For most people, these heart murmurs are relatively benign and innocent, however it can still pay to have it checked out. To listen to your patients heart, have the patient sit up straight and breath normally. If you are struggling to hear certain sounds, ask the patient to take a deep breath. Position the diaphragm of your stethoscope over your patient’s upper chest, then along the midclavicular line of the chest, then the lower part of their chest. Make sure you do this on the front and back of the patient to get a good idea of all the sounds. The normal breathing sounds of your patient will sound “clear”, like listening to someone blowing air into a glass. Abnormal breathing sounds can include: wheezing, “rhonchi” or snoring like sounds, or “rhales” which can sounds like someone popping bubble wrap. There you have it! We hope you found these tips on how to use a stethoscope useful! Only a few simple steps and you’ll be listening to the sounds of your patient’s body like a pro in no time! Maximizing the acoustics of a stethoscope is important for maintaining a clear reception of the noise you are listening to. Always use an earpiece that fits tightly into your ear, this will stop external noise and help you to hear through the stethoscope better. Don’t bend the tubes too tightly or you risk damaging them. There is a reason why you see doctors carrying their stethoscopes around their necks.It’s not a fashion statement, more so because trying to fit it into one of their pockets will damage the tubes or get dirt into the earpieces. Why Does a Doctor or Nurse use a Stethoscope? What are doctors and nurses listening for when they use a stethoscope? It can vary depending on the symptoms you had when you presented at the hospital or clinic. Most likely though, they are using it to listen to your lung and heart sounds. They may also be listening to your intestines and blood flow in arteries and veins. When a doctor or nurse listens to your heart, they are generally listening for the “lub-dub, lub-dub” sounds that your heart normally makes. However, sometimes “whooshing” sounds called “heart murmurs” can be heard. These “whooshing” sounds can be caused by irregularities in blood flow and tell the doctor that closer examination may be needed. When listening to the lungs with a stethoscope, a doctor or nurse will listen for wheezes and crackles. Wheezes can occur when the airways are restricted, and crackles can occur when there is some fluid in the lungs. Normally these sounds should not be present in a healthy lung! 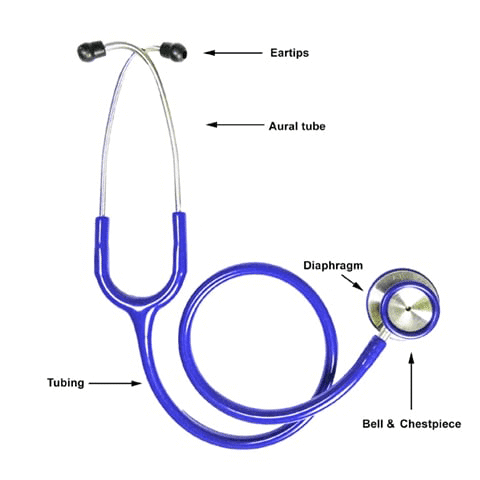 The stethoscope, a doctor’s best friend and companion, is an acoustic device used in medicine for the purpose of auscultation or listening to the internal sounds of a human or animal body. It is also used to listen to sounds of the intestines and blood flow in the arteries and veins. The traditional or acoustic stethoscope has been around for more than 200 years. 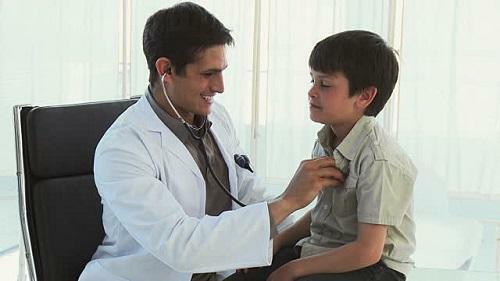 Although a very simple instrument, the stethoscope is an indispensable diagnostic tool in a doctor’s repertoire. Over the years, the design of the stethoscope has remained quite the same, rarely straying from the original design. However, the recent years have seen many technological advances in this field and the electronic stethoscope or stethophone has emerged. Now that you know how to use a stethoscope to listen for irregular heartbeats and abnormal noises from people’s lungs remember to act responsibly. If you are not a trained medical professional do not attempt to diagnose any health problems you may think you notice while using a stethoscope. If you hear any irregular noise that gives you cause for concern contact a professional at once. I’m probably leaving out some information. What other tips can you provide? Tell me about your experience in the comments below.